The companies of this category provide all kinds of certifications. Technical inspection, due diligence and wind measurement companies can also be found here. 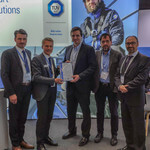 TÜV SÜD developed a new certification procedure to ensure the safe and reliable use of this innovative support structure.